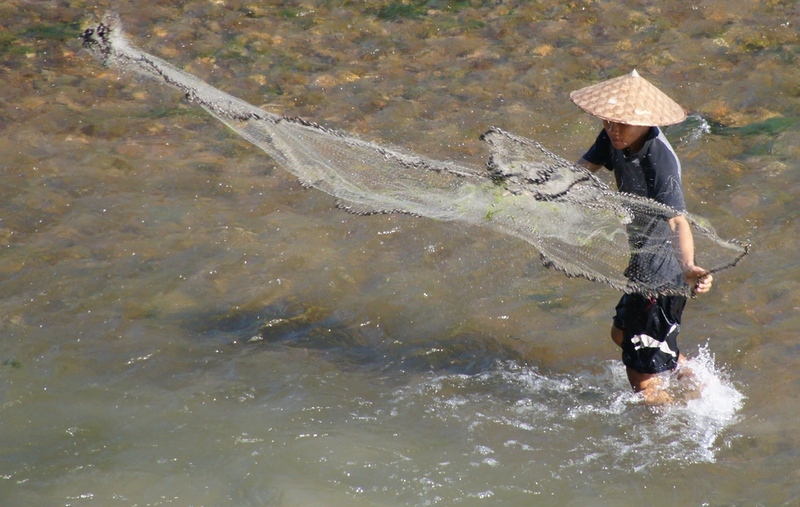 In this candid action travel photo of the day, A local Laos fisherman wearing a conical hat is casting his wide fishing net in the river in Luang Prabang, Laos. I remember distinctly taking this photo from an overhead vantage point. Luckily, at the time I had my extended zoom telephoto lens which allowed me to capture the action down below from a considerable distance. Although more advanced forms of fishing are replacing traditional methods, one can still see many traditional fishermen in South East Asia. While traveling in the Mekong Delta region of Vietnam I noticed many fishermen using fishing techniques likely passed on from generations/decades ago. It was fascinating to see the level of skill involved in such a pursuit. My Dad taught me how to fish as a youth and its one of my fondest memories in terms of us bonding together. This is a travel photo from Luang Prabang, Laos. If you’d like to see my entire extensive image collection from this fascinating cultural hub click on the fisherman below.